May-Ling calls out to me as I get out of the car. She is fourteen months old and her sweet voice bounces out through the screen door where she is standing and out on to the street in North Ryde where her Chinese grandparents live. I climb over the small white iron gate that leads to the front door. Every week she waits for my arrival after Playschool has finished on television. May-Ling has soft chubby legs and tiny artistic fingers. Her hands are so well co-ordinated that now she is able to grasp a spoon and feed herself. She has almond shaped brown eyes and very white teeth that you get to see very often because she laughs so much. In her pink and white gingham floppy hat that she wears to the park, she looks even cuter. What a cutie, say people on the street when I take her out for a walk in the stroller. What a cutie. I am the apprentice grandmother. The Chinese grandmother shows me what to do. She might correct my nappy changing skills, show me that I have done the nappy up too tight, that I need to be able to slip my hand in between the nappy and May-Ling’s fat tummy. Or she might show me how I need to rock May-Ling back and forth and pat her gently on the bottom so she’ll fall asleep in my arms before putting her into the cot. The thing is, it takes time for our experience to make its way through our consciousness. For example, it is hard to write about a journey while you are still in the midst of the adventure. We have no distance from what is happening to us. The only things we seem to be able to say are ‘having a great time’, ‘the weather is good’, ‘wish you were here’. It is also hard to write about a place we just moved to, we haven’t absorbed it yet. We don’t really know where we are, even if we can walk to the train station without losing our way. We haven’t experienced three scorching summers in this country or seen the dolphins migrating south along the coast in the winter. Anny saw him again today. He looked older. Their paths crossed on the cliffs between Bronte and Bondi. He walked with a woman she had never seen before. The woman had long beautiful legs – bronzed a clear nut-brown. She was wearing a man’s undershirt and brown shorts and had a crochet bag hanging loosely from a black nylon strap draped over her hips. Her hair was long and it flicked out in golden corkscrews over her shoulders and down her back. They were laughing. He walked right past Anny and kept right on walking. My daughter, Erika and me at the launch of my new book, My Year With Sammy. Notice the fountain pen in my hand ready for all the book signings 🙂 The cover of the book is a painting by my talented daughter. The book was well reviewed nationally in newspapers and magazines in Australia and internationally on Goodreads. I am very happy, especially as it’s my first novel to be published. Here is what Kerryn Goldsworthy said when she named the book ‘Pick of the Week’ in Spectrum Books. My name is Libby Sommer and I’m a Sydney writer. 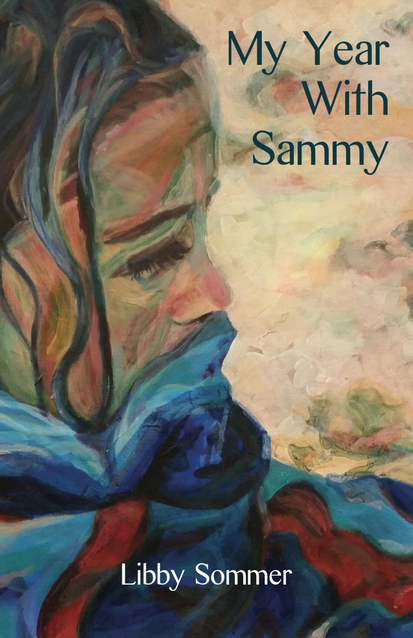 My first book, ‘My Year With Sammy’ was published by Ginninderra Press in December, 2015. It’s available as a paperback and an eBook. I started to blog on WordPress in February this year as a way to communicate with other writers and readers and to share some of the things I’ve learnt . 32 of my short fictions have been published in literary journals in Australia and the U.S. I post one of these stories each fortnight on WordPress. Every other week I post something about the writing process. My tips concentrate on one aspect of the craft of creative writing. My second book, ‘Tales of the Crystal Ballroom’ has been accepted for publication by Ginninderra Press and will come out later this year, or early next year. The stories are about some of the characters who dance in a fictional dance hall. My short story ‘At the Festival’ is published May 2016 in Quadrant. And I’m proud to say I’ve had a poem accepted for an anthology of Social Justice poems to be published by Ginninderra Press in July 2016 to celebrate their 20 year anniversary. Sorry for the shameless Self Promotion. As I live and work alone, blogging is a way for me to connect with a community of like-minded people. Isolation is the bane of the home office worker. As a creative person, we need heaps of time and space alone and we work in a room all by ourselves, although my preference is to work with pen and paper in a cafe surrounded by other humans. We also need stimulation and social interaction. My children are grown up and lead their own lives. My life mostly consists of reading and writing, working out at the gym, Yoga, coffees or lunch with friends, spending time with family, movies, long walks in nature, bush dancing (previously Ballroom and Latin American dancing). It’s a pretty good life, except for that damn problem of isolation.